Forex, Futures, CFD, Indexes, CryptoCurrencies…. The new profitable trading strategy — based on Structural Target Patterns (ST Patterns) — presented in this book is able to bring a monthly profit equal to 100% or more (on average) of the deposit amount. To be successful in today’s Forex, Futures, Indices, Commodities and other liquid markets, most of the knowledge and trading techniques accumulated over the last two centuries are not needed at all. The technical portion of a profitable trading system only needs to include the ST Patterns Strategy. SECOND EDITION (October 2018)! In the time since publishing the first edition, I have received very helpful feedback from many readers. Without needing to change the system design, I have worked with an editor to expand this edition and clarify the material, particularly in areas where readers have asked questions. This is the first book in the series of his trading books that explains his ST Trading method. The method is explained well, there are plenty of pictures and graphs to illustrate the concepts. You will need to take some time to unpack the ideas, and test the method. I did- and it works very well. I would encourage traders to get this book first, before they buy the other two. This book lays the foundation for the other two books. This book provides readers with a new way to see forex charts. The author has clearly studied his business and his strategies thoroughly and carefully, and he provides insights and advice for a variety of skill levels and personalities. I think it would be impossible to read this book and not come away with new trading knowledge. Very precise explanation and clear instructions. I want to thank the writer for sharing this with us. An interesting technical strategy. Perhaps this is the best system in terms of making the most of the way the market movements. The ST Patterns Trading Manual will provide a detailed hourly technical analysis using EUR/USD pairs for May 2017. Calculations of the results are performed based on the actual results without rounding off. 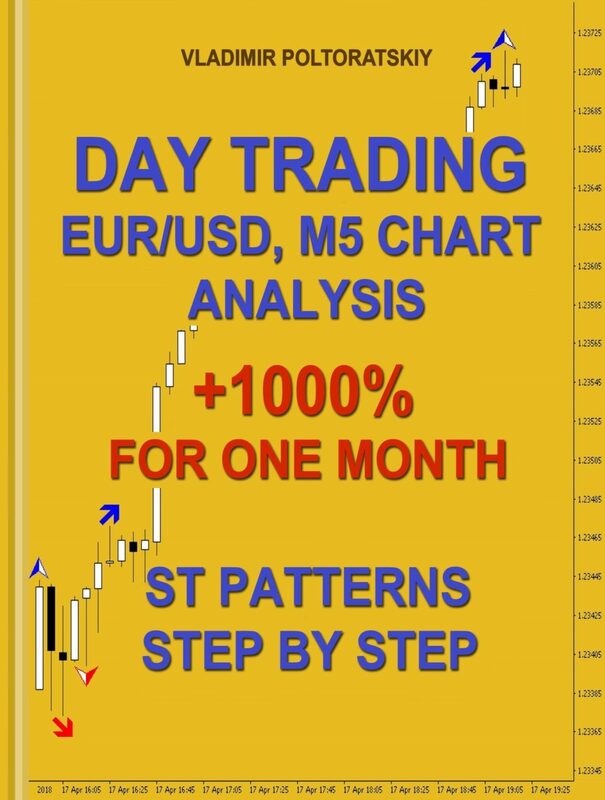 Thus, the ST Patterns Profitable Trading Strategy shows a good technical result for the EUR/USD pair in May—equal to about +300% of the initial deposit, with a risk of 10%. 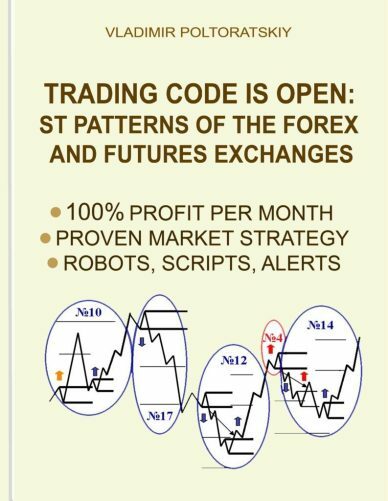 The analysis, based on accurate calculations, will help traders consolidate the knowledge gained in the book "Trading code is open...", and to increase their own skills with Structural Target Patterns. To demonstrate the flexibility of the strategy settings and the formation of short-term uncertainty periods, the EUR/USD pair is shown on five-minute charts in one working day on May 31. As a result, for nine hours of work, the profit was approximately + 82% of the initial deposit. 5.0 out of 5 stars: Excellent trading system! The ST patterns strategy shows the best result of all the trading systems I know. Reliable results! Precise and accurate calculations. So, ST Patterns Strategy should take its place among the well-known profitable trading systems! 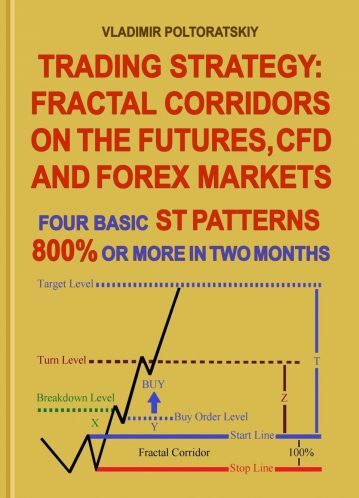 This book concludes the publication of material on a new, effective ST Patterns trading system based on Fractal Corridors. An open method of technical analysis is applicable for short- and medium-term work in many liquid markets, including, for example, Forex, Futures, Indices or Commodities. To simplify the construction of models, the rules for working with the four basic ST Patterns, which are common for all graphic combinations, have been singled out. The rule of excluding completed Corridors from the game can facilitate the analysis of complex models. A detailed technical analysis of the EUR/USD chart for the period from July 1 to August 31, 2017 shows a result equal to +800% of the initial deposit. The influence of economic news coming out on schedule is shown, which, if taken into account, has the potential to significantly increase the received profit. This book seems to be a very important contribution to the theory of markets, since the idea of ​​patterns stands out strongly against the background of the most existing theories about the markets behavior. It can be used not only as a model explaining fluctuations in the market, but also as a detailed manual for trading on the stock exchange. Therefore, looks like a really useful desk book for traders. 5.0 out of 5 stars: Excellent example of a working trading system! This is the third book published by Vladimir all of which have been extremely useful. Well thought through and designed profitable trading system. Pay particular attention to the chapter reflecting on the trading mentality and psychology - use author's experience instead of learning that all the hard way. 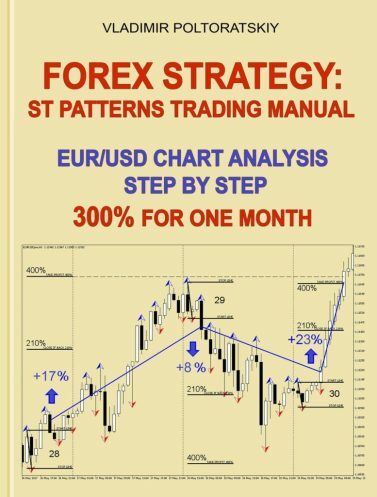 This book shows a technical analysis of the five-minute EUR/USD chart using the ST Patterns Strategy. Consecutive work with all movements that occurred during working hours allowed for the initial deposit to increase by more than ten times in one month! This manual is intended for traders who have already studied the ST Strategy in the first books and want to apply it to intra-day trading. In addition to the previously shown models, new nuances are revealed when trading in small time periods. Demonstration of the application of ST Patterns for intra-day trading once again confirms their high efficiency. Based on the ST patterns trading system built upon the first 3 books. This 4th book focus intently on the faster 5min EurUsd over a period of one month, clearly demonstrating its effectiveness against a backdrop of economic data releases and political uncertainty. However, a perfect understanding of the rules, fast thinking and quick reflexes are still needed to extract the stated profits. This bonus book is aptly ST patterns on steroids!! It takes some practice, but it works. Nowadays, the situation on the exchange markets is that brokers make a good and stable profit by getting income from transactions. Of course, this is if they themselves do not engage in the market game. Brokers are reluctant to disclose the following information: about 95% of traders lose, 3% keep their account intact, and only 2% earn money on their transactions. How long the players who comprise this 2% continue to make a profit is not specified in the available statistics. A long-term trader or investor can buy shares in a growing industry with a target horizon of several years. And, if he is lucky, he can close the position before the fall, earning a profit. If he will risk 1-2% of his capital in one transaction, then the game can be stretched for years. Markets can grow for many years both in relation to the rise of the economy and due to inflation. The Internet and digital computing in general opened the exchange markets for traders who do not have solid trading capital. Therefore, millions of traders choose a faster short-term or medium-term online trading system. However, the players gaming on these short distances have much less chance of success. Without taking into account phenomenon such as a brokers’ deceit, there are two main reasons that explain such a situation. The first is the absence of a real working profitable trading system for most traders! And the second is emotional decision-making. Technical and fundamental analyses are two different methods of analyzing market behavior. Fundamental analysis is important for investment or long-term conservative trading, but it is not suitable for fast online trading strategies. The basis of the existing technical analysis methods is Charles Dow's theory, which explains the behavior of price trends. Further methods that developed this theory were also aimed at catching the moment of directed movement in the market. The situation in which a trader earns on a trend and loses money during periods of uncertainty has become practically an axiom. The effectiveness of trading systems aimed at forecasting the development of a trend often depends on the trader's ability, almost intuitively, to interpret the current market situation. These rather predictive methods do not give an unambiguous answer regarding what will happen in the future. Among the many publicly available theories created over the past two centuries, none is able to prove its practical value at the present time. To verify this fact, it is necessary to spend years on their study and practical application. It is possible to spend a lot of time discussing the weak points in various known exchange strategies. However, there is no point wasting time on predictive methods of trading. Today, there are trading robots programmed to perform all known trading strategies. They can be bought rather inexpensively, and the historical data proves that all of them nullify the deposit in the final result. Thus, trading strategies programmers know this well. Well-known graphic models and patterns, by their nature, resemble ghosts: they sometimes appear, and not everyone can recognize them. In the search for a universal method for determining exchange movements all possible known natural laws and phenomena have probably been used. Thus, people's desire to know the future has produced many technical methods that sometimes work, sometimes don’t, and often require almost extrasensory abilities from the trader. It is obvious that there are significant differences between the classical graphic models and ST Patterns. As a result, the trading system presented in these books reflect the majority of market movements and give the trader unambiguous signals to action. In addition ST Patterns are almost always present in the market and consist of market charts. Following one after another, they create a graphic exchange chart. Profitable trading ST Patterns Strategy remove from the market the uncertainty inherent in the previously known graphic compositions and simplify the work of the trader.